As Jesus entered Jerusalem on what we call “Palm Sunday,” His many followers acknowledged Him as the promised King. They cried out, “Blessed is the King who comes in the name of the Lord!” (Luke 19:38) The entrenched theologians of his day didn’t believe Jesus could be the prophesied Messiah. In fact they had given up hope that the prophecies were even true. They asked Jesus to set His disciples straight. Jesus had already criticized the Pharisees and their forefathers for not believing the prophets, and of even putting them to death (Matthew 23:29-36). Today, while Jesus’ predictions about the future (Matthew 24:4-8) are coming to pass right before our eyes, and the majority of evangelical believers wonder if the promised return of Jesus to take His believers away (known as the “Rapture of the Church”) might be near, many churches are neglecting this subject. This is fascinating. 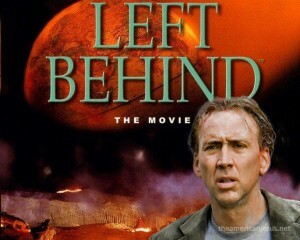 While many churches have stopped looking for the “blessed hope” of the Rapture, Hollywood has adopted the message. Two major movies: one already out, and the other “coming soon” to the big screen are powerful reminders of this biblical teaching. So, if your local church hasn’t mentioned this vital aspect of Christian belief lately, you might want to make a trip to the theater to hear the message. This entry was posted in Apologetics, Eschatology, Evangelism, Rapture, Revelation, Revival, Youth and tagged Apologetics, Bible prophecy, Hollywood, Left Behind, Rapture, Revival, The Revelation of Jesus Christ, youth. Bookmark the permalink. 3 Responses to The Stones Cry Out: Don’t Ignore the Rapture! Well, did u read JOHN 17:15? A man on Sid Roth’s “Supernatural” program said that Jesus revealed to him that there is no pre-trib rapture. His last name is “Storey” if I saw it right. Others like him are abounding! We are now in 2014 last months. Blood Red moons (tetrad) and the sun darkened are significant signs. Could the CONCLUSIONS from all of these signs be but another “hype”? The word “soon”, relative to the rapture has lost nearly all of its credibility. Any thoughts on how much “hype” and “imminent return” speakers have credibility left?